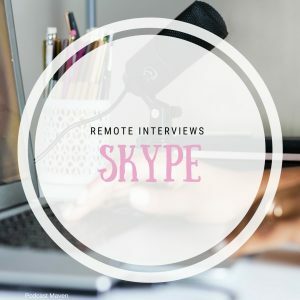 Podcast 101: Remote interviews – What can you use to record your podcast interviews? This past week on IG @the_podcast_maven I have been posting tips on how you can record remote interviews easily. Some of the software I mention you’ll be familiar with but there are some new players that I think deserve recognition and support. Your first option is to use the old fav Skype. It’s simple to register for a Skype handle even if you haven’t used it for years. It’s free and you can talk to anyone anywhere. So how do you record this conversation? If you have a Mac then your best bet is ECamm recorder for Skype. It’s excellent, it works quietly in the background and if you tweak the settings you will get a really good quality recording. When you end your call the file is converted and saved to a designated file on your computer. Are you on a PC? You have a few options too. Amolto has been around for a while and users give it good reviews. When the call is done, stop the recording and your audio file will be saved to your hard drive. Everyone’s favourite. Every time a new podcaster is starting out I am asked if they can just record their interviews with Zoom. The short answer is yes, you can. The longer answer is I’d prefer if you didn’t. Zoom is a conferencing software excellent at what it does but it wasn’t created for podcasting. If you have great sound on your end but your guest does not. It’s a real mission to clean up the audio as I only have a single MP3 recording to work with. Your life will be easier if you have a separate track for yourself and each of your guests. Now some people have said that Zoom allows you to have a separate track for your guest if you can do this go for it. Zencastr. I love Zencastr, I have been a fan since they started out and up until today, they work really hard to smooth out any kinks and answer any questions users might have. How does it work? Register for an account, login to Zencastr, create an episode and send a link to your guest(s) record your interview. when you are done you will get an audio file for each guest. This will make your editor very, very happy. Try it out, let me know what you think. This is a relatively new player on the block. I need to tell you about have not tried it yet. I found these guys at #PodcastMovement18. The bare bones it’s you register you send a link to your guest. You record, you get an audio file at the end. They also you to record video. Have you tried Squadcast yet? I love the innovation that’s happening around podcasting. Go check them out. Do you have any questions? I’m here to help, go ahead and book a discovery call on the contact page. If you’d like to try out one of the options above I’m happy to do that.